The Japanese symbol for raku means enjoyment. 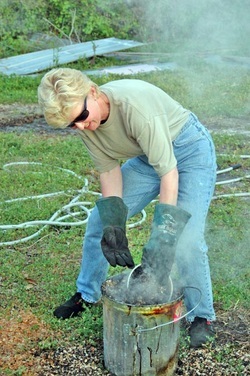 The raku process was originally developed in Japan during the 1600’s. It was a fast, low fire (1800 to 1900 degrees F.) technique that was used to make the cups for the elaborate tea ceremonies of the time. In the 1940’s our Western potters added the step of removing the clay piece form the fire while it was red hot and placing it in a combustible material and covering it tightly to smother any oxygen. Raku combines chemistry, fire and smoke to produce dramatic displays of color. It may be made in any style, but because of the thermal shock to which it is subjected, the typical piece is fairly small and sturdy. My process involves throwing, or hand building, a clay object. When it is bone dry I bisque fire it in my electric kiln. When cooled (at least twenty four hours later) I glaze each piece with glazes I have mixed using chemical recipes collected over the years. This part is very similar to baking, except that a respirator is usually worn to prevent inhaling some of these chemicals. This glazed bisque ware is then fired to 1800-1900 degrees F in my propane gas fueled kiln. At this temperature the glaze reaches a molten liquid state. I identify this by watching through a hole in the lid of the kiln. When the piece looks like it is coated in glass the kiln is opened and the pieces are removed with tongs. They are red hot and immediately put in a container with combustible material; dried leaves, sawdust, straw, newspaper—anything that will burn—and burn it does! At this point a tight fitting lid is applied to smother the flame. The flame needs oxygen to burn and since it is smothered, a reduction atmosphere is created. With oxygen in short supply carbon and carbon monoxide take oxygen from the clay and glaze materials. This post-reduction process is why the beautiful colors and surface qualities are so unique. No two pieces will ever be alike. This is when the mystery of each piece reveals itself and the essence of raku comes alive for me. The excitement of pulling the vessel out of the container and watching the colors change, or the crackles emerge, right before my eyes is the final thrill of a long and tedious process. All that is left to do is scrub the soot off of the piece. The beautiful smell of smoke remains with the vessel for several days.